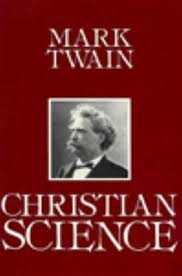 Christian Science begins, as Garry Wills notes in his introduction, with Twain's description of a man who "falls off a cliff and finds his bones projecting from him like the arms of a hat rack. After a course of treatment from a Christian Science practitioner, he calls in a veterinarian and pays the Christian Scientist with an imaginary check for an imaginary cure." Although Twain recognized that everyone was born with "the power which a man's imagination has over his body to heal it or make it sick," he was deeply suspicious of the empire-building, power-mongering, delusions, and evasions of the founder of the First Church of Christ, Scientist, Mary Baker Eddy. Wills notes that "Christian Science can be read at several levels, all rewarding--first, as a satire on Christian Science's wilder pretensions and its founder's deceptions; then, as an example of Twain's regard for language as the indicator of mental and moral conditions; and finally as part of a biographical descent into the nihilism of his last days. On all these counts the book gets us very close to the heart of American culture."